Teething is a nightmare for pretty much every mom I’ve met! It makes your kid grumpy and moody. Try and think back to when your wisdom teeth came out. Your head was aching, your neck was aching, everything just hurt and everyone was in your way. Normal inflammation from teething usually causes a low grade fever of about 37.5°(99.5 F). If a fever rises above 37.5°(99.5 F) it can be from a secondary infection, like ears or tonsils. These are common complications from teething! Then it is best to head over to the doctor. Many say fever is natural and necessary. I agree to an extent but a fever of 39° – 42° (102.2 – 107.6 F) is dangerous. Babies get sick very quickly. I’ve seen our son go from 38° to 40° (100.4 – 104 F) in under an hour. If your baby is under 6 weeks old and has a fever, rather take her to the doctor. and Paracetamol (eg. Panado or Empaped). If you gave anti-inflammatory meds such as Nurofen, you can give Paracetamol 4 hours later, vice versa. But Paracetamol should only be given eight hours after the previous dose of Paracetamol, the same goes for anti-inflammatory (ibuprofen). Sometimes when my son is very ill the only thing that I have found breaks a fever is Voltaren – which is also anti-inflammatory. Remember, ibuprofen can only be given after babies are 6 months old. Never give aspirin to a baby or toddler. 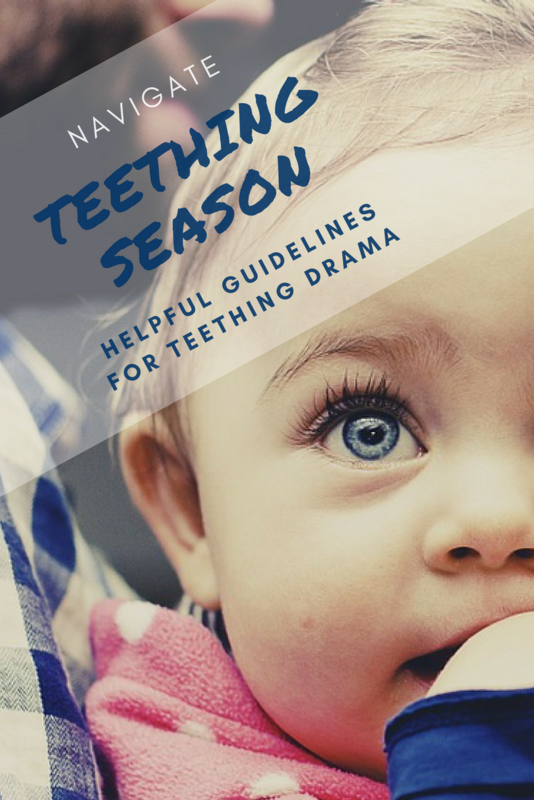 Teething babies should always be closely observed as symptoms are easily chalked up to teething while there might actually be something else seriously wrong. Using an over-the-counter local anesthetic like Dynexan or Cerene teething powder on swollen gums also really helps quite quickly. Drench a clean washcloth in purified water and put in the freezer. It helps to gum down on something cold. Breastfeeding is a great way to ensure that they still get the nutrients they need when they don’t want to eat. It also soothes and comforts them. Momma’s milk is the solution to most problems. Just beware of biting! ! They tend to do so when teething. Always offer enough clean drinking water when they have a fever. Even when they are not thirsty. If your sick child is hydrated, the race is halfway won! Remember to keep their faces moisturised as the constant drooling tends to dry out sensitive skin. Disclaimer : I am not a medical practitioner and this is mommy to mommy advice which should not substitute any medical advice to treat or prevent any condition. Remember that ibuprofen is a strong medicine and can cause stomach ulcers with prolonged use. Use these meds sparingly and only when discussed with your pediatrician. You are encouraged to verify this information with other sources. Do not delay seeking medical help having read anything on this blog. Follow your God given mommy instinct, more often than not it will guide you in the right direction.